Summer has arrived in the Republic of Panama and that is certainly good news for anglers looking to catch these colorful acrobats of the ocean. 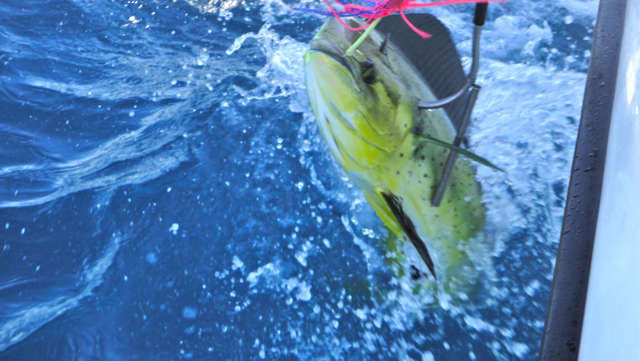 December is traditionally one of the best months for Mahi, and this year is no exception. These fish are just about everywhere off the Northwestern coast of Chiriquí, Panama, often in great numbers. It is not unusual to catch and release 25 – 30 of them in a single day. This week, fishing with Come Fish Panama, were Bill, Dan, and Efrain, who were looking to get in on the action. 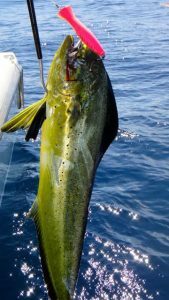 They were told that the Mahi action was hot and that the Marlin started to show up off our coast, but these anglers were interested in Mahi. The Marlin would have to wait for another day. We could not have asked for better weather this week. Heading offshore in 1/2 foot swell with clear blue water like glass, we witnessed a grand sunrise over the Pacific. It wasn’t long before we saw birds and Bonito feeding on small Squid as if it was an indication that this was going to be a great day of fishing. Our destination was not far off where we saw one boat getting ready to toss out their Mahi lures and another one rigging up for Marlin. 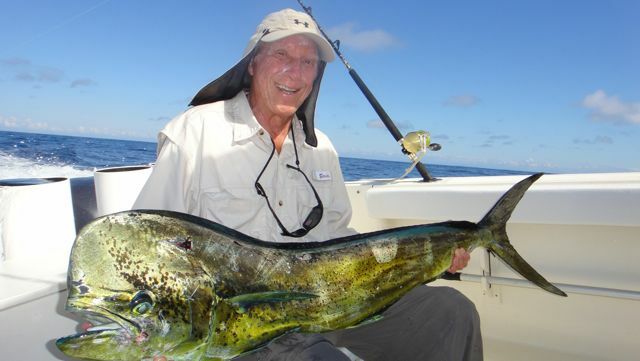 It is not uncommon in Panama to hook up huge big Mahi bulls while Marlin fishing, even though the bait may be a live 3-5 pound Bonito or Skipjack Tuna. Arriving at our spot, we deployed a 6-line spread to kick things off, and instantly were hooked up with Mahi. We repeated this numerous times with the 3 anglers taking turns fighting the leaping fish. In order to provide Bill, Dan and Efrain a different experience, I instructed the Mate to bring in all the lines and stow the gear away. Out came the spinning gear. We like to provide our anglers as many effective techniques as possible. 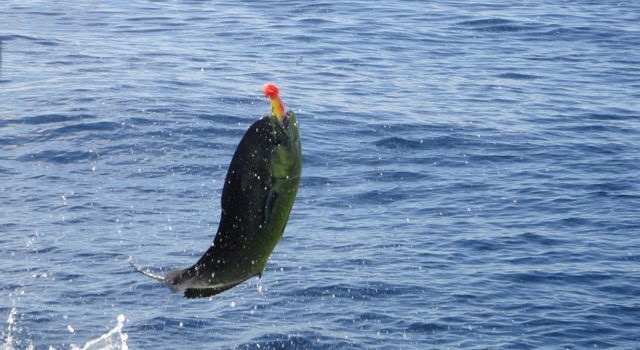 We targeted an area where Mahi should be cruising by, and sure enough, fish on! Reels screamed, rods bent over from the strain, and the anglers loved it. To many anglers, me included, this type of fishing provides for a sporting and exciting day out on the water. None of them had ever caught Mahi on popper or jigs and were visibly excited to have experienced the new challenge. They took several turns popper fishing before heading back to the dock. for another fun day of fishing the productive Gulf of Chiriquí. 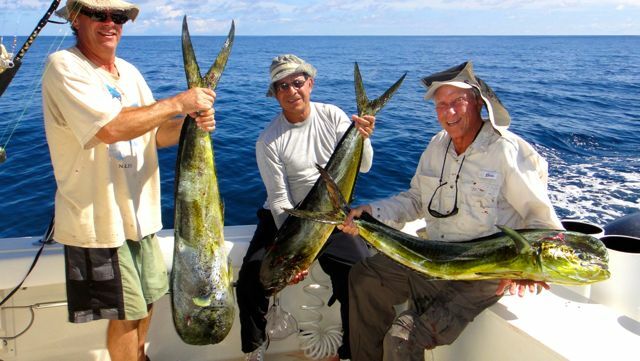 Below you will find the action photos of Bill, Dan and Efrain enjoying their day with the Mahi. 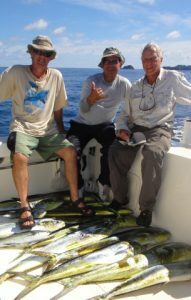 Whether you are looking to hook up with a mighty Marlin, powerful Yellowfin Tuna, majestic Roosterfish,or any number of other species, Come Fish Panama can provide that for you as we are the most affordable Offshore Sports Fishing Club in Panama. Don’t miss out on an opportunity like this. From all of us at Come Fish Panama, we hope you have a wonderful and safe holiday season. We look forward to having you sport fishing with us here in Panama.